Today I had the pleasure of being invited to tour the workshop of Robert Loomes, one of Britains few remaining watch makers… and what a treat it was! The Georgian sand stone town houses of Stamford feel a rather apt setting for the work undertaken by Robert and his team of highly skilled watch makers. Indeed, crossing the threshold you immediately leave the modern world behind and seemingly step into the pages of David Copperfield. Moving up the tight staircase and ducking under low-hanging doorways we start at the top of the building. In the two attic rooms are a couple of guys hunched over antique clock faces currently undergoing expert restoration. As well as making top quality watches Robert Loomes also restore all manner of timepieces for clients including many of the UK’s top collectors and museums. However the top floor is also where they house a kiln to enamel their own watch faces. 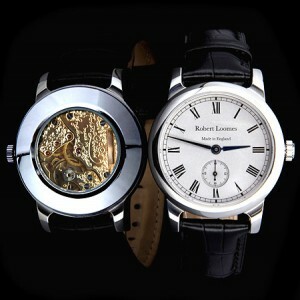 Robert Looms are currently the only watch maker in the country to still undertake this processes, and you can see why. Starting with a copper base plate they hand grind the enamel and sieve the powder over the top. This is then fired before a decal with the numerals is applied to the hardened white surface. The face is then fired once more. The issues here is that there is such a high failure rate in this process that the table is littered with dials that have failed to achieve the quality demanded. Moving down the building we enter a room crammed with copper and brass clock movements and the office of Robert himself. Robert is the chief designer of the business. His vision is to create the his own, 100% made in Britain, watch movement. Already, years in development his walls are lined with technical schematics of individual watch parts. He proudly explains that, having been told by other watch makers that making a totally British made movement was impossible, he is getting very close to proving many people wrong. That is not to say that his current movements are not made in the UK. Robert explains that he was lucky enough to have procured some 1950’s Smiths movements a few years ago. He currently modifies these Coventry made movements for his current range of watches. We continue the tour, past the ground floor, on which the reception area sits, to the bowels of the building. Suddenly, we are back in the 21th century again. This is where Robert Loomes make their British made watches and what I have been looking forward to seeing. Mixing modern technology with traditional techniques you finally get the sense here that this is a thriving, forward thinking business. Here another pair of guys are busily beavering away getting a set of watches ready to be taken to the top of Everest. These special edition watches will be carried up to the summit by the Royal Gurkha Regiment as a part of their 200th anniversary of service with the British army. Robert adds that these watches, apart from the addition of specialist oils, are exactly the same mechanically as the ones they usually sell. Being able to deal with these extremes of temperature and pressure must be testament to their hardiness and quality. It is clear that, while Robert Loomes is a businesses in love with tradition it is also keen to look to the future. Robert himself is committed to British manufacturing and it is great to meet someone for which this is a real passion. Robert Loomes watches range in price between £5000 – £20,000 and are made in limited edition of between 5-100 pieces. What a great story, I love the fact they are making watches for the Gurkha’s to take up Everest.